It is easy to think of the Holy Spirit only in a mystical, almost magical way: The tongues of fire at Pentecost, the mighty wind, the fluttering dove. The Church, and today’s readings, tell us otherwise. But that is not how we normally encounter the Holy Spirit. The Catechism spells out the everyday ways the Spirit comes to us daily — through the Church — and today’s readings (the Sixth Sunday of Easter, Year A) demonstrate each. 1: We know the Holy Spirit “in the Scriptures he inspired” — which means we have to keep his word. But when the Apostles hear about a community of Christians in the first reading, they don’t send the Bible – they send apostles. We also encounter the Holy Spirit via the bishops who speak in unity with the Church. Jesus tells the apostles: “You will know him because he remains with you, and will be in you.” The Holy Spirit to this day guides the Church and we can meet him by looking into what the Church teaches. In the first reading, the Apostles hear that the Samarian Christians’ sacramental life is lacking, so “they laid hands on them and they received the Holy Spirit.” He similarly sent the sacraments via bishops and priests to us. As the Psalm puts it, “Blessed be God, who refused me not my prayer or his kindness!” He won’t refuse our prayers, either. 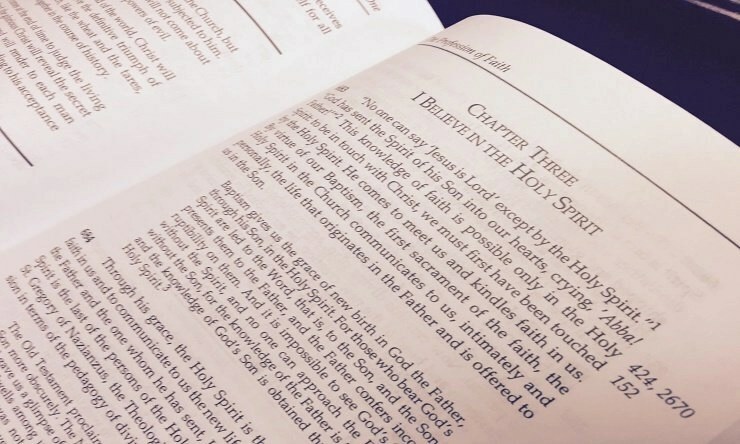 In the first reading we hear of all that Philip did in Samaria: “unclean spirits … came out of many possessed people, and many paralyzed or crippled people were cured.” These charisms exist still in the Church today, evidence of the Holy Spirit among us — along with equally powerful if less dramatic charisms — religious and lay teachers, preachers and saints of hospitality. Add evangelizers to that list. St. Peter in the second reading says “Always be ready to give an explanation to anyone who asks you for a reason for your hope.” Those who explain the faith also bring the spirit. The ways the Holy Spirit are neither vague nor otherworldly; they are eminently practical. There is no sense waiting for the Holy Spirit to zap us — he is as close as the nearest Bible, Catechism, confessional or tabernacle. It is he who is waiting for us.